...or so I tell myself. 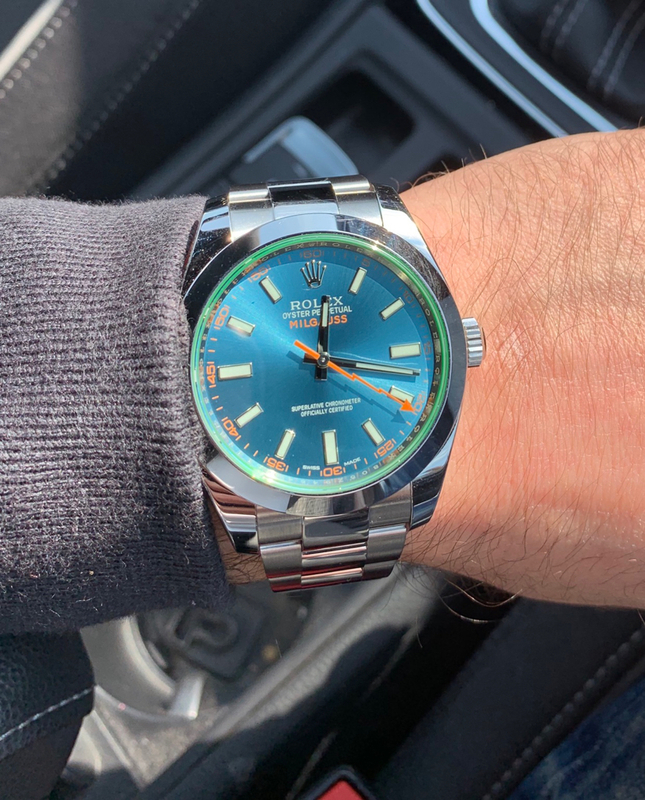 Picked up a Rolex Milgauss a few days back from ASW1 and I’m now convinced my watch buying days are over. On a sunny spring day is there a better looking watch? My watch buying days are also over with my last purchase, the one before that and the one before that one too . . . .
Only a fool keeps buying and selling for the sake of it. I last bought a watch a couple of years ago and have no intention of ever doing so again. Nice, happy perspective about watches - on a watch enthusiasts forum. The way this catches the light is sooo good. I've really fallen for that particular model over the years. Never say never!!! Ive gone back up to 4 after consolidating to 3! "Watch buying days are over..."
As spoken by a true addict! Watch buying days are over....”for now”! I've always liked that version, the blue dial, green tint crystal and the orange second hand all work well together. I've always loved the blue Milgauss from the time I developed a real interest in mechanical watches. I agree blue dial, green tinge and orange second hand is a striking combo. Size is great too. I will have one at some time. It sure looks nice under that sun. You love a dig don't you. My point is simple, an enthusiast will buy a watch because he likes it. If he wants another , he buys it and then he has two. If he likes another, he buys it and then he has three and so on. So he eventually ends up with a nice little hoard. Those who buy and sell usually lose in the process and end up with not a lot. I have seven watches that I like, why on earth would I ever sell one. One might sell a watch in your position, if another watch became available that the individual liked more than some or at least one of the seven current watches, but could not afford to buy the next watch without selling. Its worth noting that different people have different perspectives - god knows it would be strange place round here if everyone had my OCD in relation to watch buying. I can see the point about having to sell in order to buy but the reality in such cases is that the enthusiast will have to sell and buy quickly and that is a dead certain way to lose money. The sensible way is to buy what you like when you have the funds and not before. Well done, very nice watch and looks great on your wrist. I tried on the black dial GV at an AD in Ho Chi Minh District 1 yesterday. I was surprised to actually see it in there. I've always liked the look of them but it felt quite small on the wrist. It was £6400 with 7.8% vat return (if you were heading back to the UK). Not sure what UK RRP is? That watch is an absolute knockout. One of my favourite Rolex models, partly because it’s such a departure from their usual colour palette. I expect most non-enthusiasts would be surprised to discover that it’s a Rolex. It’s a gorgeous thing, and in my view it’s a real triumph in design to use such a vibrant combination of colours, along with the ‘lightning bolt’ hand, and still end up with watch that looks beautiful and prestigious as well as fun. I can’t think of another watch like it. I hope it makes you smile every time you look at it. I am bloody happy old chap. I have a nice little collection of watches and I could easily sell the lot and make a profit on everyone. Also I have the right amount that suits me. All I have done is point out that buying and selling is usually a loss making experience. But you haven’t though, you called anyone doing this a ‘fool’ which is complete and utter rubbish. One of the fascinations with this hobby is that tastes can change. 5 or 10 years ago I’d never have predicted the collection I’ve got today and who knows, in 5 or 10 years it may be different again. Be bland and vanilla, that’s fine, but don’t expect everyone else to be. You say you could easily sell your whole collection for a profit...but then next say buying/selling is a loss making experience. Make your mind up. What a lovely combination of colours. Really nice watch. Lovely watch Mike, does this mean the OP will/has moved on? Yes, the OP is up on SC. Unfortunately have to make room in the safe...and keep the wife happy! You are getting very colourful Mike! I hope you still get time to enjoy the YM?? That Milguass is rather special, we’ll done! This is true of course, but only Mick's perspective is the right perspective and we should bow down to his superior insight. 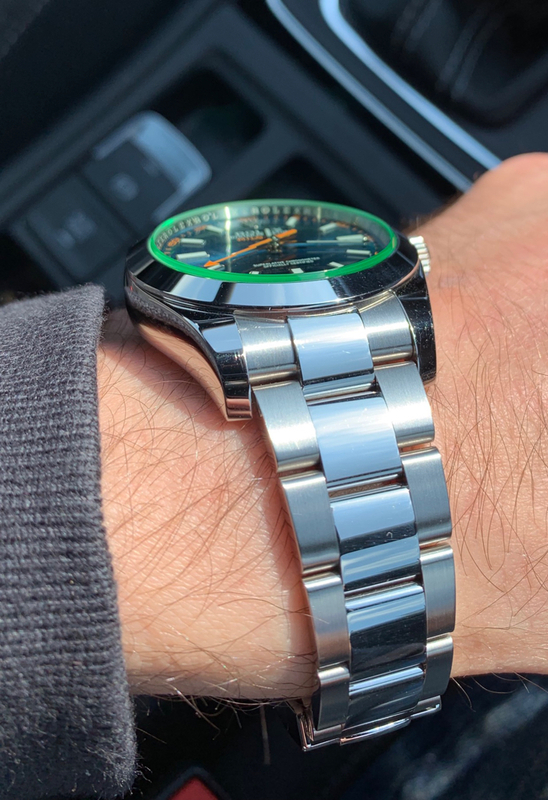 I do like the Milgauss, one of the few modern Rolex models that really does it for me. Nice one.